I wrote an article on my web site in September 1997 expressing my skepticism, and posted on local newsgroups to warn people away from the company. I also wrote to both Andrew Seybold and Alan Reiter, each of whom had been conducting their own research using their more extensive contacts in the communication industry. They each subsequently wrote articles of their own, which I referenced from my web site, along with other information such as links to all the distributors advertising the product. Shortly after this I received my first phone call from AlphaCom. The caller threatened to sue if I didn't take down my web site. It was quite a disturbing phone call, and was followed up with a cease and desist letter. I really had nothing to gain by keeping the site up, but I didn't like the idea of being silenced by a legal threat, when I was quite confident that everything I had written was true. I had a few sleepless nights before making up my mind to keep the site up. What I did do was carefully edit out everywhere that I expressed my own skeptical opinion. This kept all the same information, including the quotes from others more qualified on the subject to have opinions. And the top of the page still said "Too good to be true?". 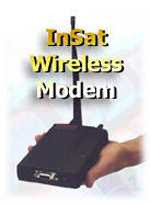 By 2000 I had stopped seeing advertisements for the AlphaCom Insat Wireless Modem, so I took down the site, and put up a web site with general information about CDPD. I'd read quite a lot about the technology and legitimate providers of CDPD modem technology and wireless service during the time, and thought others might find this useful. Back in 2004/2005 most US providers shut down their CDPD networks in favor of newer and faster standards. I am writing this article as I finally get around to deleting my obsolete CDPD site. In late 2004 I came across an interesting footnote to this episode as I was making an update to the site about how AT&T and many others were shutting down their CDPD networks. As I researched some details, I happened upon an SEC litigation release about AlphaCom. A complaint had been filed against the officers of AlphaCom in 2003. Among the defendants named was the very person that had threatened me, verbally and in writing, with legal action. Yes. It was too good to be true.